The Bradley Fighting Vehicle development program is infamous when it comes to convoluted Pentagon procurement initiatives, but it did go on to successfully serve in Iraq during two separate and very different wars. Of all the M2 Bradley's supposed innovations, one of the most unique accessories that were developed along with it was a funky derivative of the M16 assault rifle tailored for firing from the armored fighting vehicle's six firing ports. In some aspects, the weapon, although dated by today's standards, was far ahead of its time when the first Bradleys began being fielded in the early 1980s. The M231 Firing Port Weapon (FPW) is certainly one of the more obscure derivatives of Eugene Stoner's iconic rifle design. It came out of a requirement to field the Bradley with a new weapon that was particularly well suited for firing from inside the vehicle's tight confines, through its gun ports, even while on the move. The gun ports themselves were largely a response to the same feature being included in the latest Russian armored personnel carriers of the era. In fact, before the Bradley program was officially underway, a similar requirement existed for the program's predecessor, the doomed Mechanized Infantry Combat Vehicle (MICV). M2 Bradley IFV circa 1985. By the mid 1970s, the Army was looking at different designs to fulfill its Firing Port Weapon requirement and by 1979 a derivative of the M16A1 developed by the Rock Island Armory was settled upon. At first the design, which uses an open bolt firing concept and extra heavy bolt carrier group, had a short barrel and small wire-framed, twin-armed, telescoping stock. Basically it was the grandfather of modern day Personal Defense Weapon derivatives of the AR-15/M16. As development continued and the Bradley finally began to take shape, the M231's barrel was increased in length from 11 to 15.6 inches to better take advantage of the 5.56X45mm round's ballistic properties. The telescoping stock was also omitted. Some say it was left off production versions of the weapon because it got in the way when firing the weapon from inside the Bradley. 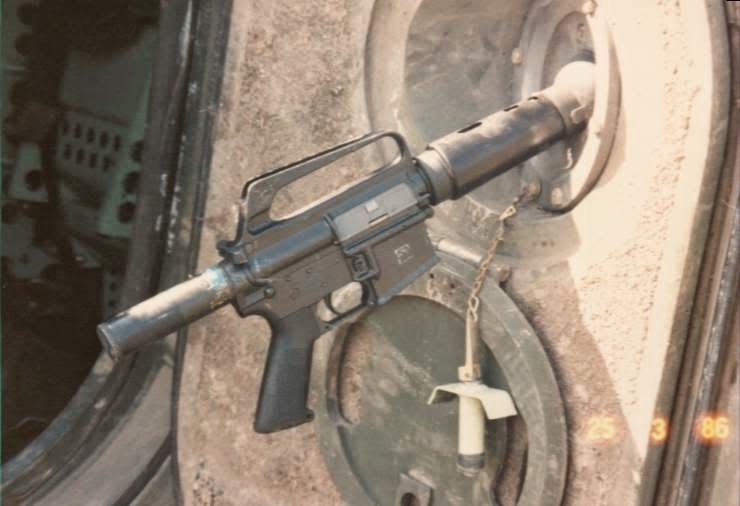 Other reports state it was left off to deter soldiers from using the compact FPW while dismounted instead of their primary combat rifle, the M16. The M231 used a special buffer design with multiple nested springs instead of just one buffer spring. The buffer tube looks very much like AR-15 pistol buffer assemblies that are so common in the civilian firearms marketplace today, but at the time of the M231's genesis, the AR-15 pistol was still a very obscure oddity in itself. It wouldn't be until the early '90s that the concept would really catch on. Unlike modern AR-15 pistol derivatives, the M231 was only fully auto capable. Early attempts to drastically slow its firing rate were left off in the production versions. A special screw-in attachment on the rifle's forearm furniture was used to attach itself to the firing ports in the Bradley. The weapon has no traditional sights, just the grooved carry handle of the M16A1. In the end Colt was chosen to produce the weapons to coincide with the Bradley introduction into service in 1982. Originally, only the lighter weight M196 tracer round was authorized to be used with the weapon due to its barrel's slow twist. Tracers also would help troops attempt to "walk" their fire onto targets outside the vehicle. The current and slightly heavier M855 round can also be used considering the short-ranges the weapon was intended for. Long-range accuracy simply isn't a major concern for a defensive weapon like the M231. Officially, the M231 was only to be used inside the Bradley. It may have felt handy but it was and still is a questionable personal defense weapon. Muzzle rise from full auto firing, no stock, and no sights made it truly a "spray and pray" device. Not just that but its hand guard would rapidly heat up under fire. It was also incredibly loud. In the end the whole idea that troops would man the Bradley's six firing ports during battle and that these weapons would provide sustained and accurate defensive fire from multiple directions proved to be reaching concept. Over time the Bradley had all but two of its rear firing ports sealed off. But that doesn't mean the service chucked their M231s. The odd rifles ended up being used by soldiers during combat operations exactly how the Army originally said not to use them—as close-range personal defense weapons. These deadly "lead hoses" of sorts were used to defend combat vehicles from being overrun in urban environments, but not by being fired from deep within the vehicle's bowels, but from up top where crews were often exposed. From what we can tell they remain in the inventory today in limited numbers and over the last decade or so they have found themselves in M1 tankers hands as well as in those of Bradley crews. Even turret gunners in up-armored Humvees have carried them, like Medal of Honor recipient and American hero Private First Class Ross McGinnis. In 2006 a handful of M231's were disassembled and their forearm collars were used on a project called the M870REV Non-Lethal Shotgun System. Developed by the Picantinny Arsenal, the project saw Remington 870 shotguns modified to shoot through the firing ports of the EM113REV armored rapid entry vehicle. These APCs were used in overseas jails and detention compounds. The idea was that rioters could be fired at from within the armored personnel carrier with less than lethal shotgun rounds. Doing so could also keep marauders at bay while rioter-placed obstacles are cleared. You can read more about this program here. In the last decade and a half there have been many weapons that have become available that are far better suited for protecting Bradley, Abrams, or HUMVEE crews from very close-range threats, but the M231 was an available and paid for asset—one that many units didn't seem to want. Even though today the M231 seems to offer far too many compromises for its revised purpose, it's hard to argue against the idea that it was a pioneer of the modern AR-15 pistol and PDW as much as it was a relic of an era now past.